In the morning I met a friend James Arrevalo alias Chasqui. He arrived early in the morning with a group of Brazilian mystici. We greeted each other and he invited me on a mystical work. We date the 21st of June, Inti Raymi! After dropping the luggage in the entrance of the sanctuary I ran to the temple of the Intihuatana (the Stone of the Sun) and joined the 'work'. 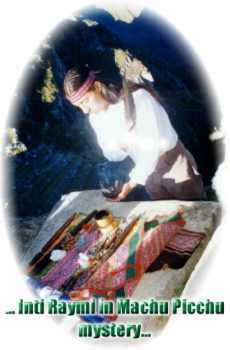 His heart brother opened the ceremony with feathers of the condor. These feathers he fluttered around our heads. It felt like a real condor flying around our bodies. At the same time James cleaned the Intihuatana with ceremonial bells. Just when the sun was going to rise above the summits on the other side of the valley, they blew on the horn of the Andes mountain goat filling the sanctuary with a deep penetrating sound, waking up the day. We were given a liquid scent of roses that had to be inhaled, opening the lungs and the mind for the outer ethereal impressions. 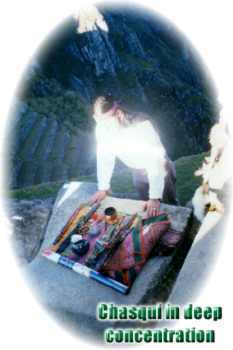 Chasqui invited us to 'feel' the Pachamama (Mother Earth) and the Virracocha (or Huiracocha, the God of Creation). The moment that the first sunrays touch the Intihuatana, the New Year has begun. As the Sun rises a triangle of light appears on the altar of the Puma. 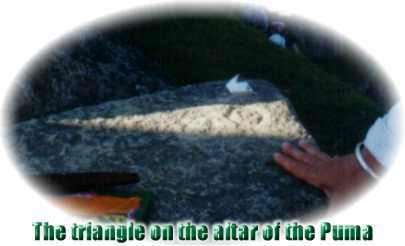 This triangle points to the East and the Putucusi mountain and is only 4 days in a year visible with the Inti Raymi, the most important festival of the Incas, the day that the Sun starts rising (winter solstice). I wrote a page about the Inti Raymi with a lot of pictures. Every year the beautiful city of Cusco organizes this festival in the fortress of Sacsayhuamán. Have a look. We stayed three more days in the Sanctuary and slept in the nearby town of Aquas Calientes. We took the afternoon train to Cusco, our wonderful trek was over. Hope you enjoyed the Inca Trail. Send reactions to our guestbook or write me an email.